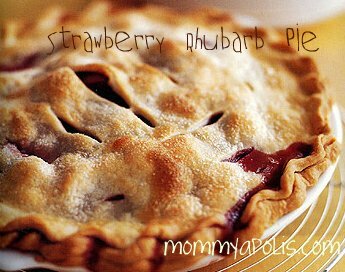 I love this time of year… planting my garden, picking rhubarb, making rhubarb desserts :)… My Dad has rhubarb plants, I do not 😦 but I take his when ever I can… I highly suggest this pie, you will love it! MMMMM….. Not too sweet, not too sour, just perfect! To make crust, preheat oven to 400°. Mix flour and salt. Measure oil and milk together—don’t stir. Add to flour. Mix until dough forms. Split the dough into two balls… You will roll out both crusts, one for the top and one for the bottom…To make filling, mix sugar, flour, nutmeg and cinnamon. Add rhubarb and strawberries, stirring to coat.Fill crust with filling. Scatter butter on top of the filling. Add top crust. Pinch edges and ventilate the top. Brush with milk. Sprinkle sugar on top. Bake on cookie sheet for 50 minutes. Can cover edge with tinfoil if cooking too fast.